Has it ever happened to you that you have opened several tabs on Firefox and soon audio or a video starts playing without your permission? You frantically scroll through those tabs to find out where the sound is being played from and maybe even close all tabs in order to stop the annoying noise from playing. Mozilla has a fix for this. Mozilla Corporation announced that it would add the much-awaited feature for Firefox users in its next update. 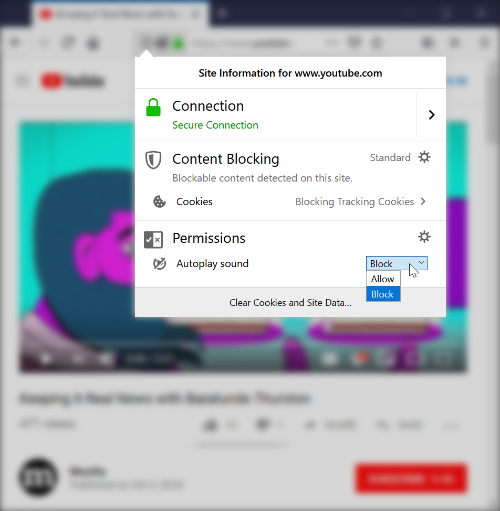 The company in its blog post stated that users would be able to mute auto-playing video once the feature is released in Firefox 66. According to the company, the next update will be released for both, desktop and Android on March 19. Once the update is rolled out, the Mozilla Firefox browser would not allow web pages to auto-auto-play audio or video without the user’s permission. Users will have to click on the play button to enable the content to start playing. “Any playback that happens before the user has interacted with a page via a mouse click, printable key press, or touch event, is deemed to be autoplay and will be blocked if it is potentially audible,” the statement read. Mozilla had announced last year in July that the Firefox would no longer support autoplaying of audio or video. Users though can opt to allow autoplay sound by making changes in the setting to allow certain websites that they prefer and want the autoplay audio and video to be played in the background. An icon would pop up in the address bar that will indicate an auto-playing media has been blocked. Users can click on it and make changes in the settings. Firefox will also automatically allow autoplay video on sites that the user has granted access to their camera and microphone. Mozilla is late to the party as auto-playing content was blocked by competitor browsers like Google’s Chrome, Microsoft Edge, and Apple Safari have already introduced the feature to limit auto-playing media content. “At this time, we’re also working on blocking autoplay for Web Audio content, but have not yet finalised our implementation but expect to ship the feature sometime in 2019,”said Chris Pearce, Engineer at Mozilla.